Whether you’re ordering delivery from Domino’s or an NYC pizza shop, chances are your pie won’t taste the same as it does when it’s served up with gourmet toppings at a bustling restaurant. Now that many Americans are warming to the idea of ordering a pizza topped with fig and prosciutto rather than canned black olives and processed pepperoni, many delivery chains seem to be lagging behind with ingredient options. I have always associated delivery pizza with cheap beer, potato chips, and onion dip. It’s for fraternity parties and Super Bowls. But the skeleton of a slice of pizza – the chewy, charred crust with tomato sauce and melted cheese – is incredibly satisfying, even when it comes from Pizza Hut. So where’s the balance? What about those nights when making a dough and sauce from scratch is too labor intensive but a plain ol’ delivery pizza just won’t satisfy? 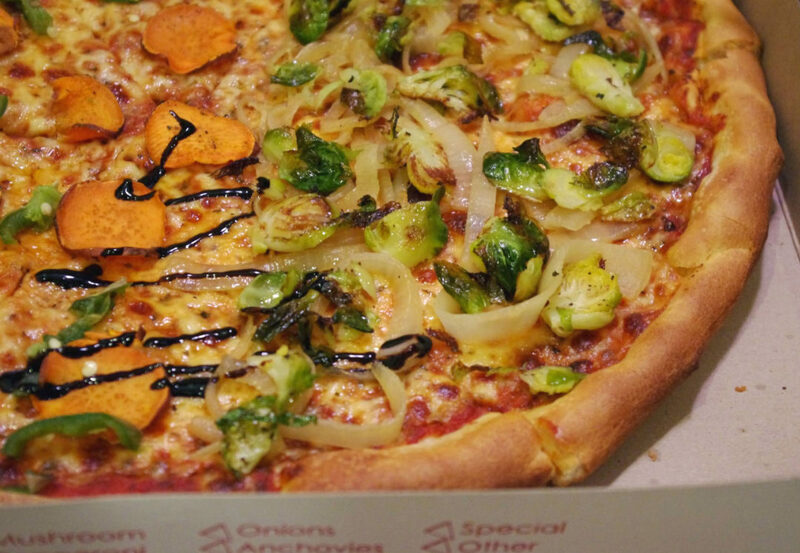 This, my friends, is where delivery pizza dress-up comes into play. That little window of time from the order to the delivery is the perfect opportunity to prepare restaurant-worthy toppings. With a few simple ingredients, you can up your pizza game and maybe even your entire Super Bowl party. Here are my suggestions for perfect pairings. These quantities were used for a 16″ pie from Big Nick’s Pizza (my favorite delivery pizza). If you’re not into spice, I’d skip the jalapeno. Order your pizza! 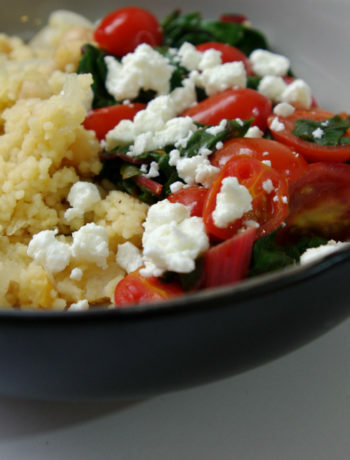 Preheat the oven to 400 degrees and begin by preparing your toppings. 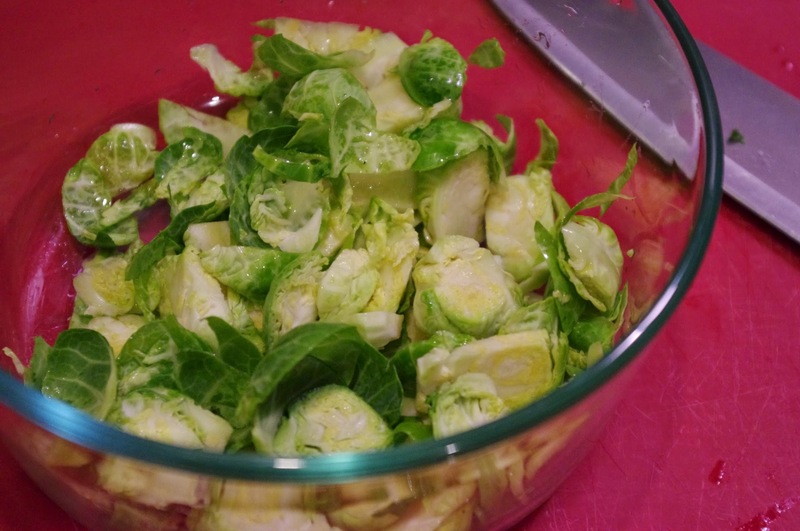 Using a large chopping knife, slice your Brussels into slivers (about four per sprout). This will make them roast quickly and develop the nice blackened edges. 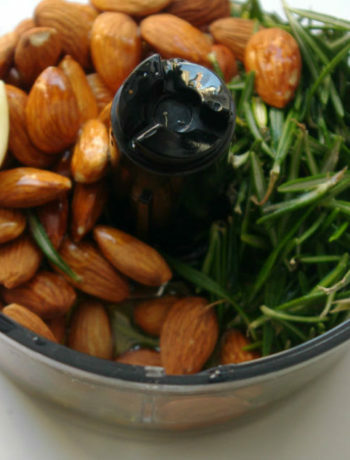 Make sure to save all of the leaves that fall off throughout the process as these make the crispiest toppings! In a small bowl, toss the Brussels slivers and leaves with a teaspoon or two of olive oil and a few sprinklings of sea salt and cracked pepper. Next up, carefully slice the sweet potato into thin disks – the thinner the better since, again, this will make the crispiest toppings. 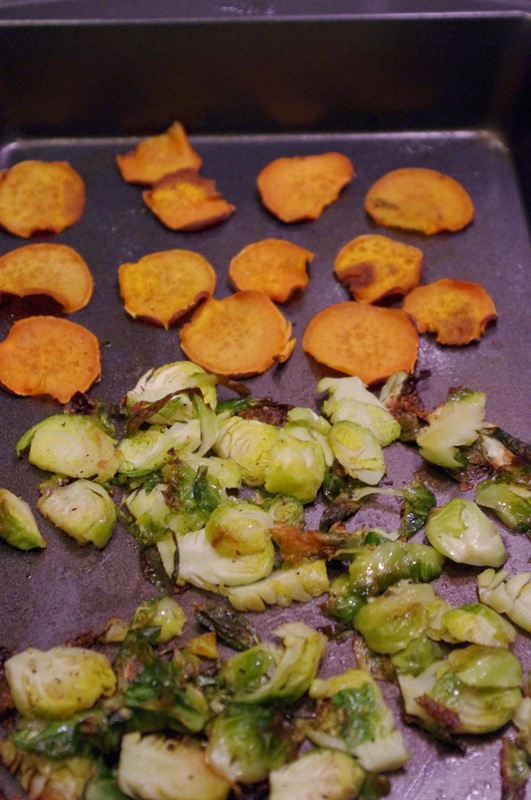 Use a cooking spray to lightly coat a baking sheet, then spread your Brussels on one half and set the sweet potatoes on the other. 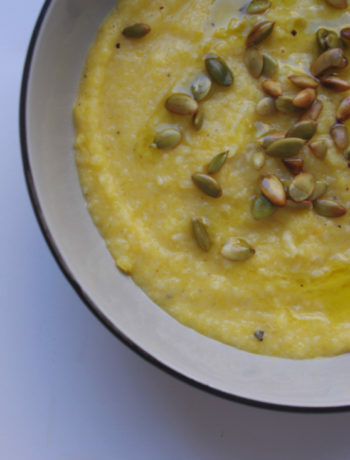 Pour a teaspoon of olive oil into your hands and dab each sweet potato disk. Top the sweet potatoes with salt and pepper. 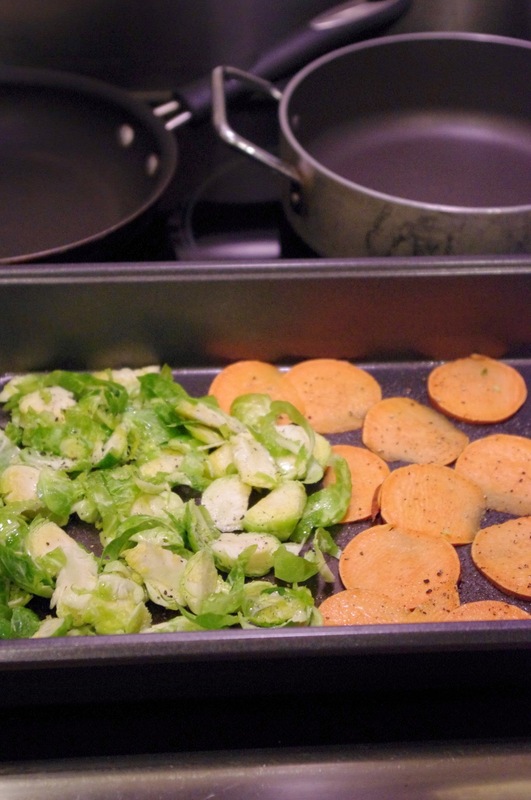 My secret to the tastiest Brussels: drizzle a touch of agave syrup over the sprouts before roasting! Go ahead and pop the sheet in the oven, roasting for about 20 minutes and flipping the sweet potato disks 10 minutes in. Next up, wash your jalapeno and plop it in the oven on a small piece of foil. It should roast for the same amount of time as the Brussels. When you remove it from the oven, slice it and set aside the stem, keeping the seeds in for extra spice (careful – you can let it cool). After peeling the white onion, slice it into thin slivers. You only need about half of an onion. In a saute pan over medium heat, drop in the butter. 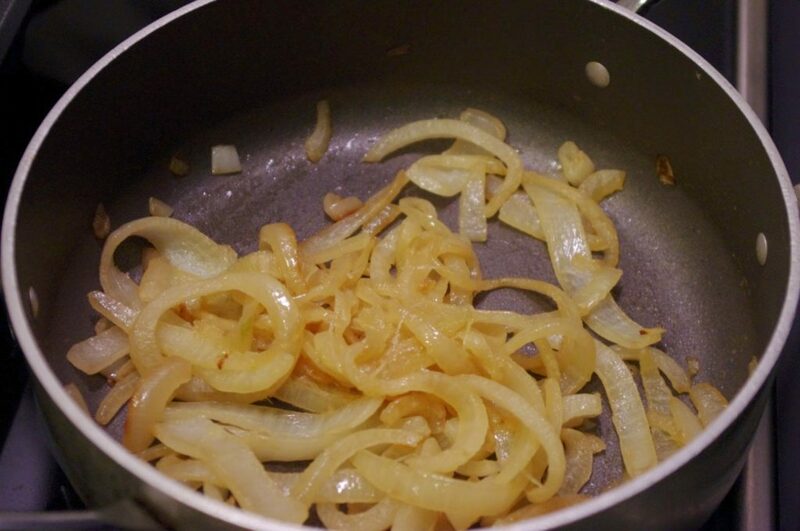 As it begins to melt, add your onion slivers and saute while stirring for 20 minutes. 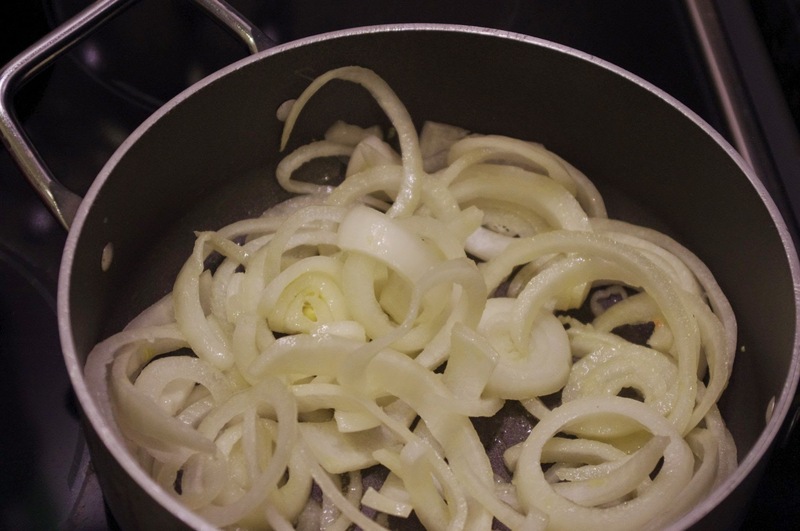 When the onions have softened and begun to turn golden, add 3 tbsp of water and let them sizzle for another few minutes until all of the water is gone. Remove from heat. 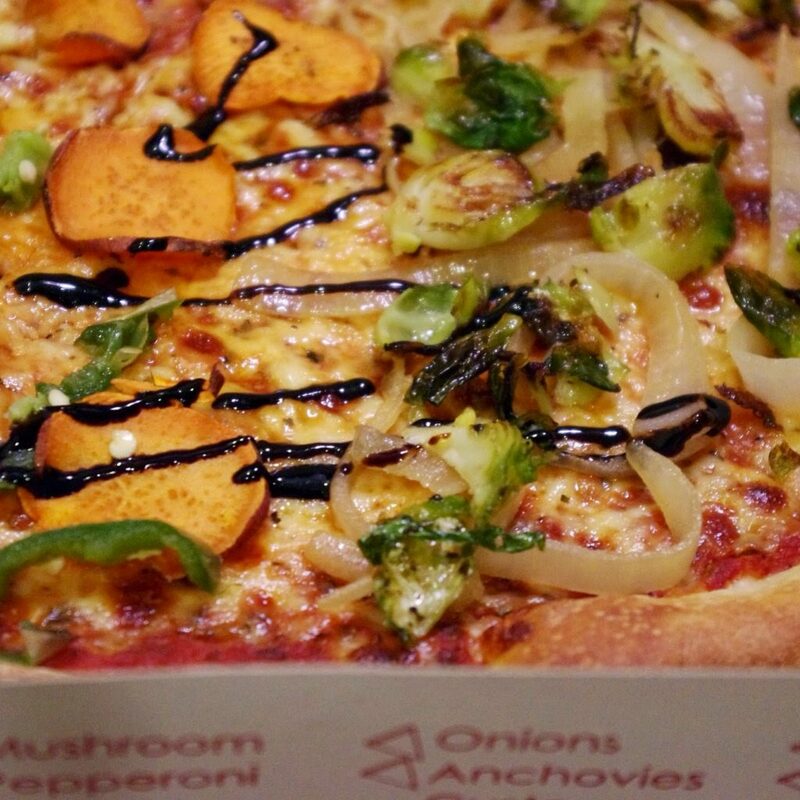 When the pizza arrives, dress it up! I laid the sweet potato disks across one half and topped with sliced jalapeno and balsamic glaze. On the other half I spread the Brussels and caramelized onions. To make things blend a bit more, pop the pizza back in the oven or under the broiler for a few minutes before serving.